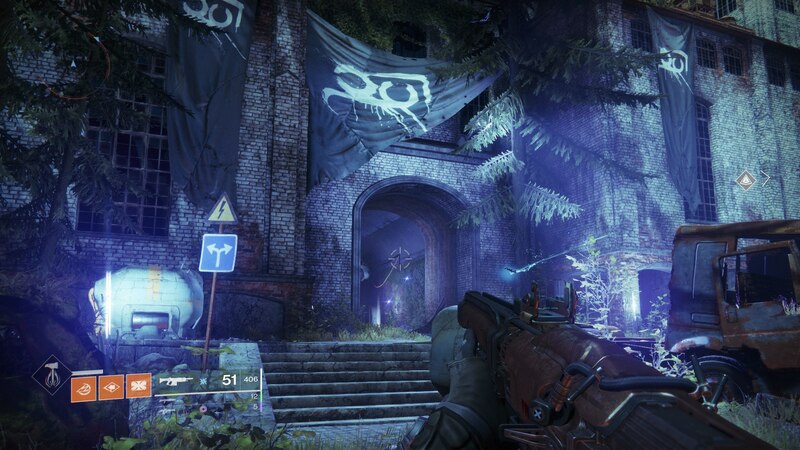 Thorn was back with a bang earlier this year in Destiny 2, and while it remains one of the more infamous weapons in the entire game, it's by no means easy to get hold of. In this complete Destiny 2 Thorn walkthrough, we'll be going over the full Exotic quest line to get hold of the hand cannon, as well as detailing the Destiny 2 Thorn Exotic stats, which showcase the true potential power of the weapon. This new Exotic quest to obtain Thorn comes in Destiny 2's Season of the Drifter, which is still going in the game right now. For all the information you need about current content, and future DLC coming to Bungie's game, head over to our Destiny 2 Season of the Drifter guide. 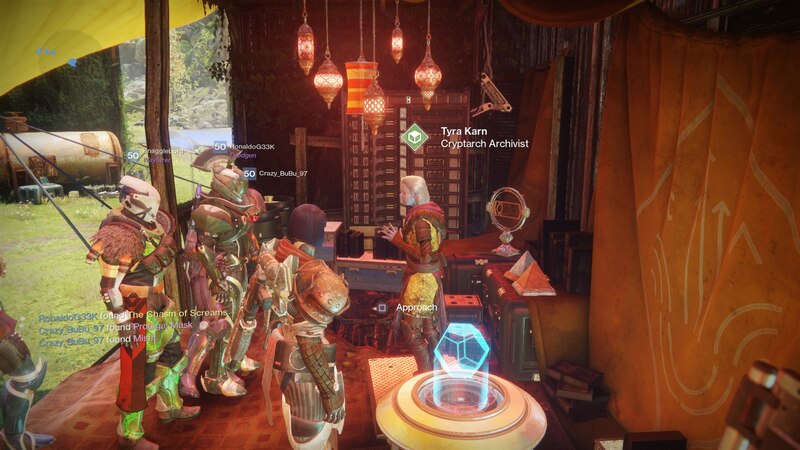 Starting the Exotic quest to obtain Thorn in Destiny 2 is a long process, let alone completing the actual quest itself. 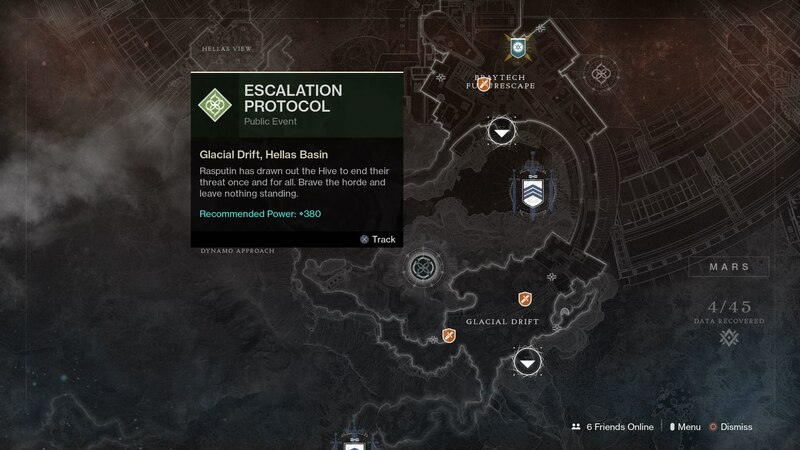 Just below, we'll break down where you need to head in order to locate the Salt Mines in Destiny 2, as it's at this location that you'll kick off the Exotic quest. 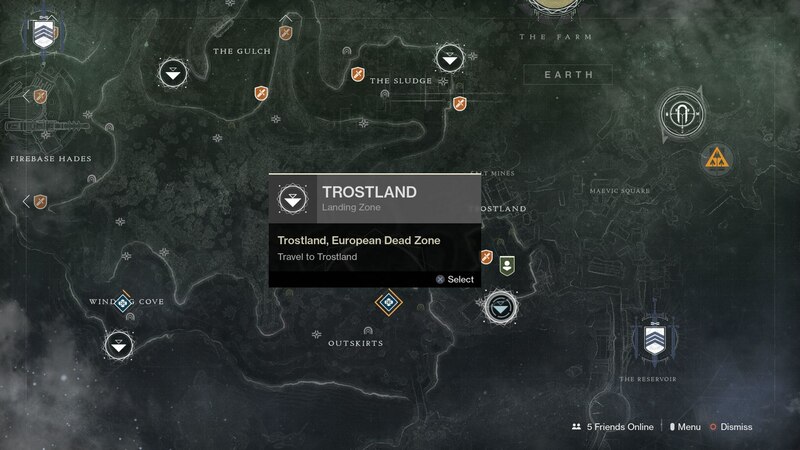 Firstly, you need to head to the EDZ (European Dead Zone). Select the Trostland landing zone, the one that's right next to the church. 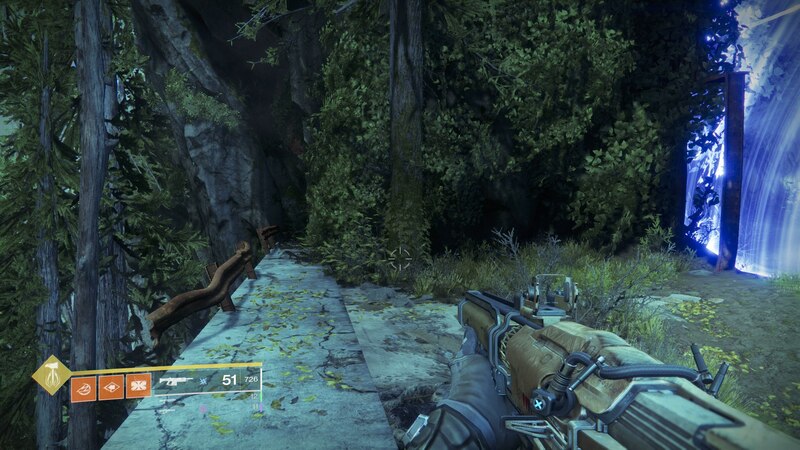 When you land at Trostland in the EDZ, you're effectively on the south side of the church. You need to make your way to the other side of the church on the north, where you'll see the path leading out of the area that we've captured just below. Head through this pathway to the north, and you'll eventually get a notification on the bottom left of your screen, indicating that you've successfully arrived in the Salt Mines. When you're in the first open area of the Salt Mines, you'll find yourself facing off against a few weaker Fallen enemies. 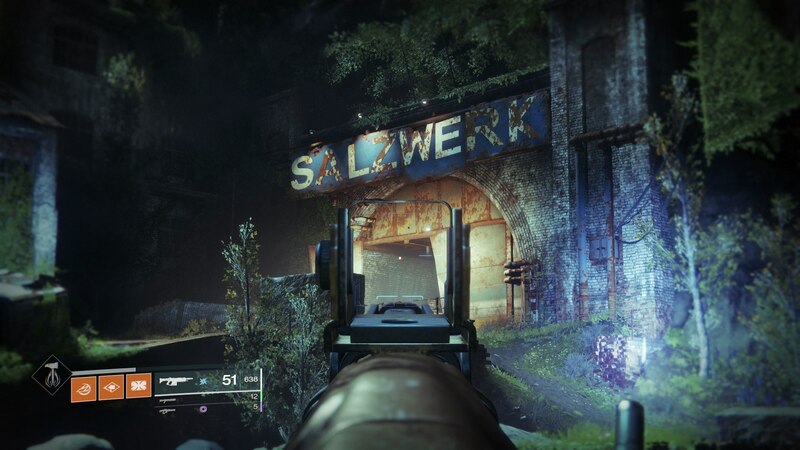 Defeat them all, and then head down the tunnel with the 'SALZWERK' sign directly above it. Shortly after heading into the tunnel, you'll come up against a few fallen enemies. 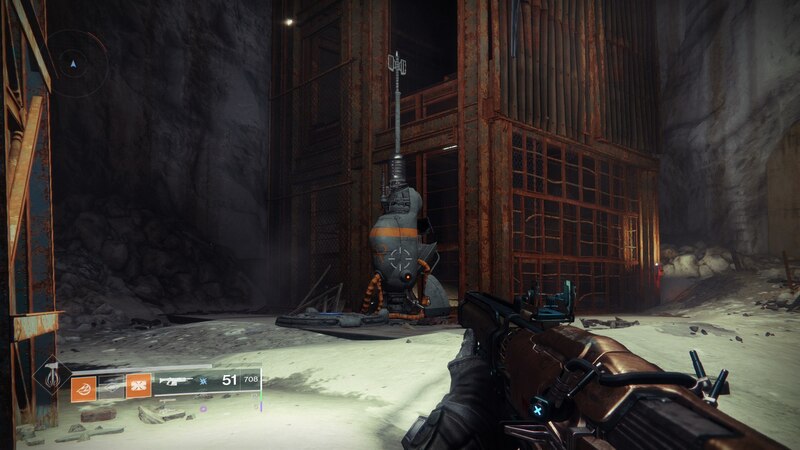 Within this area, you're looking for the device on the ground that's depicted just below, which you'll need to approach and hold down X/Square in order to transmat to a new location. 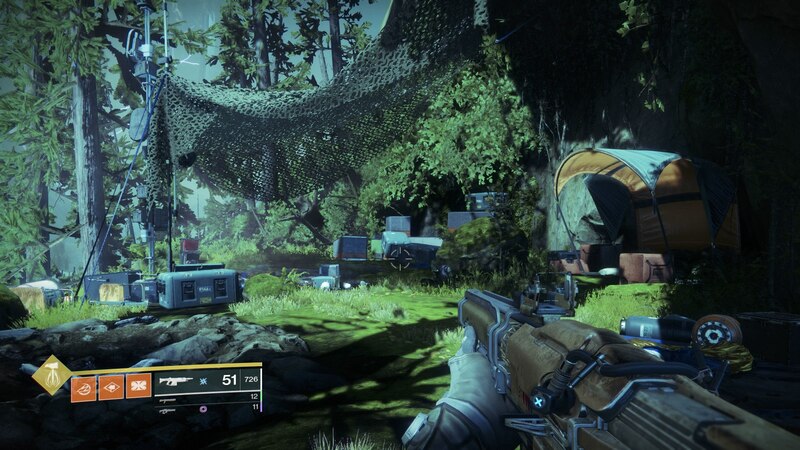 In this new location, you'll be back outside in the EDZ. There's a small pathway directly ahead of you, leading up a small hill, with a bunch of Fallen enemies loitering around, which you should head up. At the end of this pathway, after you've taken down a Fallen Captain and some weaker enemies, you'll find yourself facing a barrier of light. With the barrier on your right, look to find the small pathway that we've depicted just below. Careful make your way down this small path, jumping up to the ledge ahead of you. You'll come out at a small encampment, with a single dead character in the middle. Right near the deceased character, you'll be given the option on the box seen below to 'Sift through the ashes.' 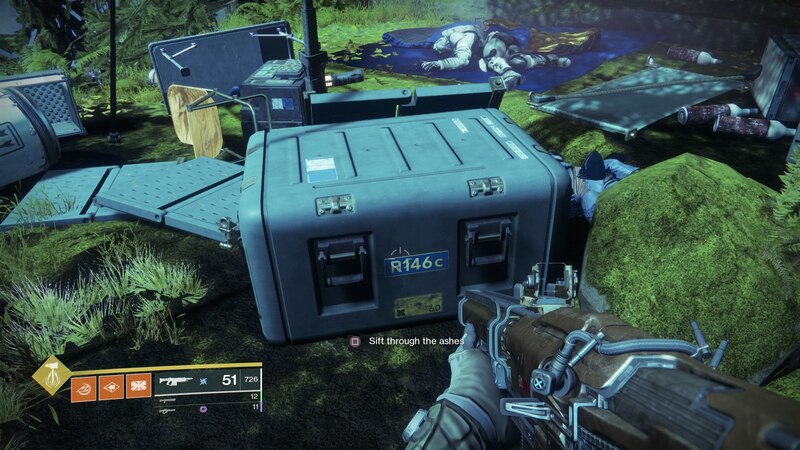 Once you've done this, you'll be given the 'Melted Hunk of Metal' quest item in the Pursuits section of your inventory, and you've finally kicked off the Thorn Exotic quest in Destiny 2. 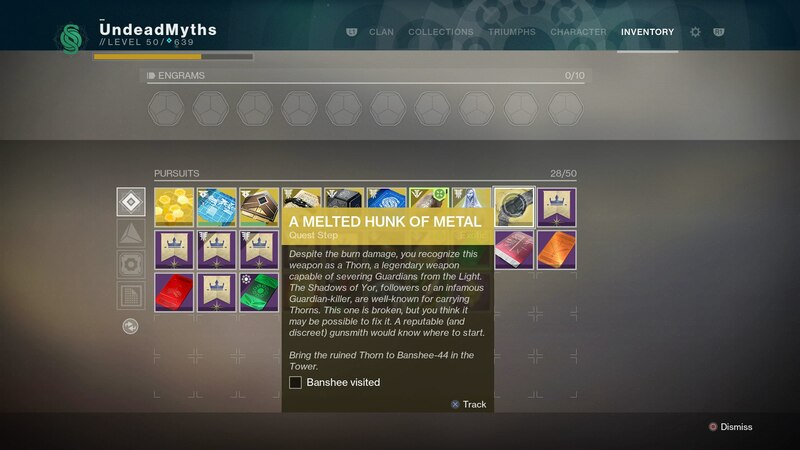 With the new quest in hand, go pay a visit to Banshee-44 in the Tower. 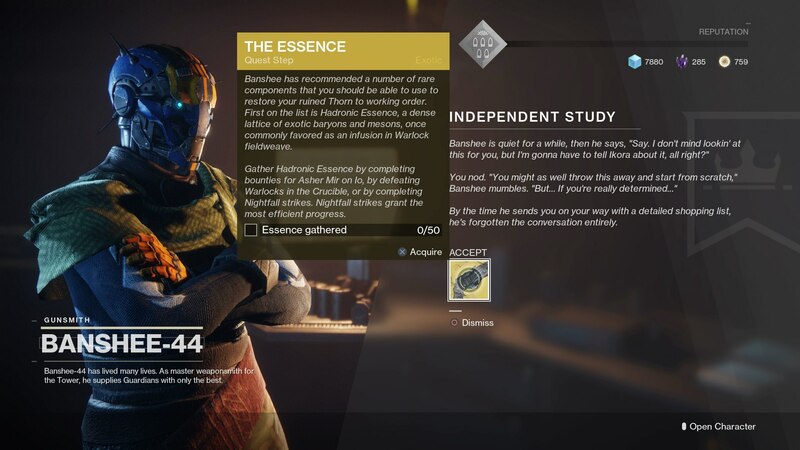 He'll now give you 'The Essence' quest objective in your inventory, the next stage of the Thorn Exotic quest in Destiny 2. Complete Bounties for Asher Mir in Io. 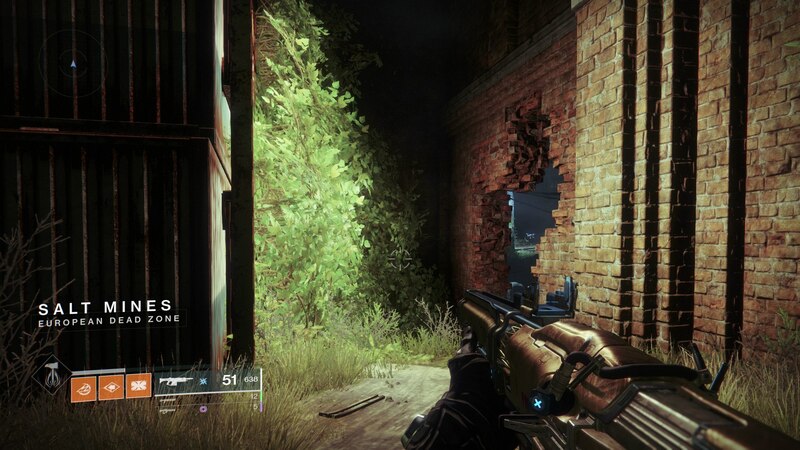 Defeat Warlocks in the Crucible. While there are three options to choose from in completing The Essence, we should note that completing Nightfall Strikes is your quickest way to gather enough Essence. But otherwise you can complete destination Bounties in Io fairly easily for Asher Mir. Complete Bounties for Sloane on Titan. Defeat Titans in the Crucible. Once again, completing runs of the Blind Well is by far the quickest method in order to obtain enough Plasteel Plating. Otherwise, your best bet is to head to Titan and undertake destination Bounties for Sloane. The third stage in the Thorn quest follows the same patterns as the previous two. Complete Bounties for Ana Bray on Mars. Defeat Hunters in the Crucible. Complete waves of Escalation Protocol. As with the previous two quest stages for Thorn, the most difficult activity rewards you with the most progress. Group up with players on Mars if you want to complete Escalation Protocol, or undertake destination Bounties for Ana Bray on Mars. Once you're done with the third quest item in this series, it's time to head back to the Farm, for just about the first time in forever. 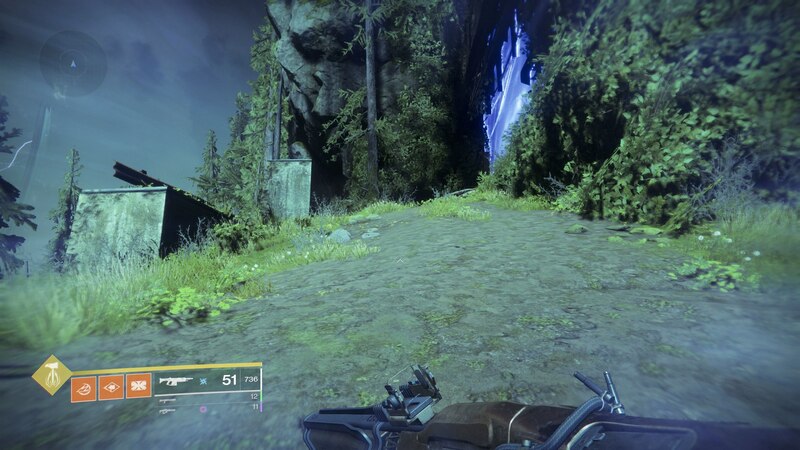 You can fast travel to the Farm in the top right corner of the EDZ destination screen, and once you're there, you need to talk to Tyra Karn. And now for something decidedly more difficult. Tyra Karn will give you the objective of completing the Chasm of Screams quest, which can be accessed from the Titan destination screen, and has a recommended minimum Power level of 660. Although this is basically a more difficult version of the Savathun's Song Strike from the base version of Destiny 2, there's no matchmaking option for the repurposed Strike. So, you're going to need to manually squad up for the mission, since there's also no option to undertake it with a squad through the Guided Games feature. But once you've done this, Thorn is yours! At long last! Now you've finally got your hands on Thorn, one of the most powerful Exotic weapons in Destiny 2, let alone one of the strongest hand cannons. Just below, we'll be breaking down the stats and perks of Thorn. TTK (Time to kill): 1.6 seconds. Mark of the Devourer - Rounds pierce targets and deal damage over time. Kills with this weapon leave behind remnants. Soul Devourer - Absorbing a remnant strengthens Mark of the Devourer and partially refills magazine. Now that we're finally done with this Thorn Exotic guide for Destiny 2, there's plenty of additional Destiny 2-related coverage here at USG. For one, there's our Destiny 2 Season of the Drifter weapons guide, compiling all the new weapons we've seen in the season so far. Tagged with Action,	Bungie,	FPS,	Guides,	PC,	PlayStation 4,	Shooters,	Xbox One.